Answer: Hood down and always try to be better than the day before. Studying might help also…. Answer: Trying to take shortcuts and being lazy. Answer: Because I’m passionate about welding and your future. Let me teach you something cool. 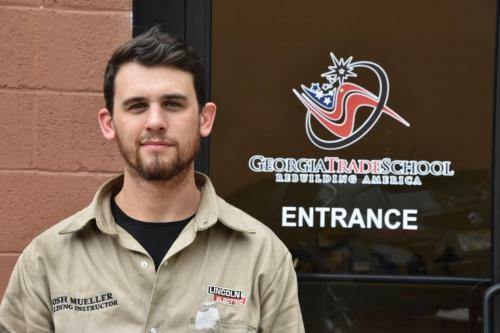 New York native Joshua Mueller joined the GTS Welding staff in the summer of 2018 following a stint at Aero Bridge Works, one of Cobb Counties top employers. A 2006 graduate of Warren County High School in Front Royal, Mr. Mueller decided to pursue a Mechanical Engineering degree at Old Dominion University in the shipbuilding hotbed of Norfolk. Along the way Joshua decided a better path was design and drafting with a specialization in Mechanical Engineering Technology. Ironically the change required a technical elective in welding which caught Mr. Mueller’s attention even though he had gone to work at the world’s most valuable company, Apple, Inc. Following a move to Georgia in 2011 and learning about GTS in 2013, a welding career was calling. In 2017 despite still working full time, Mr. Mueller enrolled and upon completion began installing passenger boarding bridges in airports from coast to coast. While at Aero Bridge, Joshua primarily performed Shielded Metal Arc welds on 48” diameter columns. In his personal life, Joshua enjoys rock climbing, hiking, motorcycles and spending time with friends.